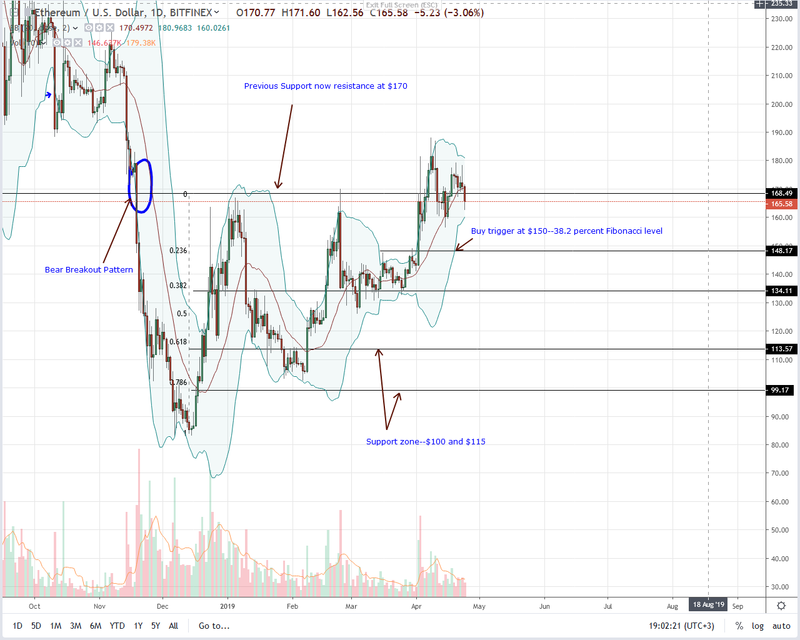 Because of how far Bitcoin has climbed since those local lows, crypto analysts believe that May is likely to close in the red as buying momentum has begun to show exhaustion, and a larger retrace is overdue. While a red May is certainly possible, past performance in Bitcoin price during the month of May suggests that it is more likely to close green. Does the old stock market adage of “sell in May and go away” make sense for the leading cryptocurrency by market cap? Following months of renewed bullish confidence in the crypto market, Bitcoin has rallied over $2,000 above its local bear market low, setting the first higher high since its all-time high was set back in December 2017. The rally has spanned over three months, first starting slowly, then picking up momentum following the break of overhead resistance at $4,200. A recent move took Bitcoin price even higher, peaking at $5,650 before pulling back to current levels around $5,450. Due to three months in a row closing green and the price of Bitcoin nearly doubling since its 2018 low, analysts are now expecting the leading crypto to retrace, leading to a red May candle close. Despite leaning toward a bearish May outcome, analyst Josh Rager doesn’t rule out the chance of Bitcoin making an attempt at $6,400 before closing the month red. Upon reviewing Bitcoin price charts over the last 9 years its been traded, the cryptocurrency has only had three monthly candle closes in May that were red. The first of which occurred in May of 2013. The next after that was at the bottom of the 2015 bear market, right before Bitcoin rallied into a new bull trend. The next red May after that, was last May, when Bitcoin was rejected at $10,000 back down to re-test support at $6,000 in the following month. Now, Bitcoin is ready to test that same support but turned resistance at $6,000 in the days ahead – resistance that is certain to be a struggle for bulls who have only recently regained their confidence in the asset class. Where Bitcoin goes during the month of May could set the tone for the next couple of years ahead for the entire crypto market, and we’ll find out if the adage “sell in May and go away” holds any merit in the crypto space. Prices and accompanying fundamentals are not in sync as Ripple (XRP) accumulate within a 4 cents range with support at 30 cents. All the same, we are bullish, and any trigger lifting prices above 34 cents or forcing liquidation below Jan 30 lows must be with high transaction volumes. There is a clear divergence. From a fundamental point of view, Ripple (XRP) should be rallying and even back to $1. However, that is not the case and to put it quite literally, XRP, the third most valuable coin with a market cap of $12,616 million, is struggling. Worse, it may drop below a critical support level, and that will precipitate losses as the coin drop to valuation last seen in Q4 2017. That’s some few days before the supper rally when XRP peaked at $3.3. Even if it may seem to be an uphill task, we cannot discount anything, especially now that fundamentals continue to flow as prices accumulate within a tight trade range. While IBM, with a firm foothold in banking and collaborating with a competitor in Jed McCaleb’s Stellar and launching World Wire with six banks willing to issue their coins on the platform, Ripple is steps ahead. First, they have a presence in SE Asia and the Middle East and are actively investing in projects, diversifying their portfolio and building infrastructure that makes us of XRP use cases. With Forte, they plan to dominate the multi-billion gaming scene and with a vibrant community pushing for integration, it’s only a matter of time before prices respond—hopefully in the right direction. 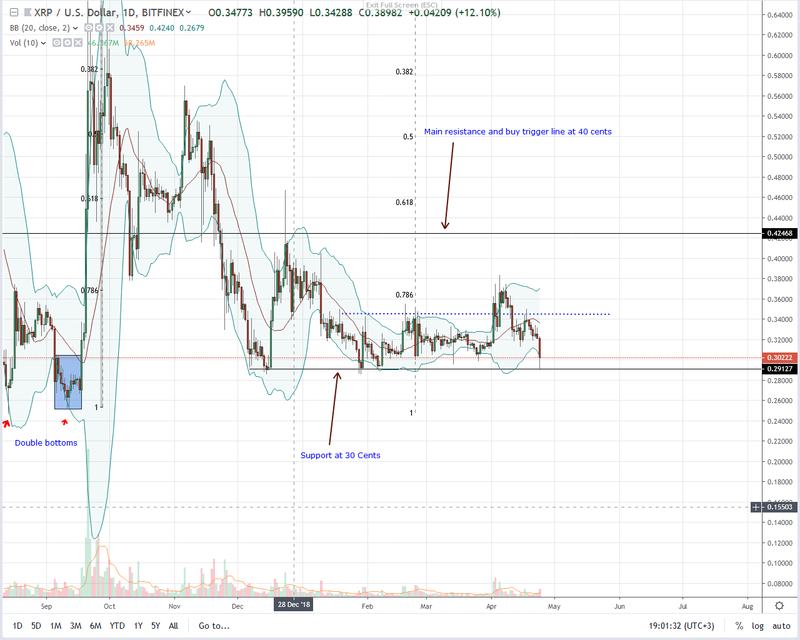 At press time, Ripple (XRP) is deep in accumulation and trading above Jan 2019 lows within a four-month, 4 cents range capped by 30 cents on the lower side and 34 cents on the upper side. To reiterate our stand, we are net bullish on Ripple (XRP) with guidance from Sep 2018 bull bar. Therefore, as long as Jan 30 lows at 30 cents hold and bears find floors at this level, then there is always a slim chance that bulls will flow back and close above 34 cents in a trend resumption phase. As it is, we shall take a neutral stand until after our trade conditions are right, that is, until XRP prices edge past 34 cents or drop below 29 cents invalidating our overall stance. Despite our positive outlook, today’s meltdown did reverse gains of Apr-2 albeit with low transaction volumes. Average volumes stand at 16 million meaning for trend confirmation or bull-trend cancellation, confirming bar must be wide-ranging, closing above 34 cents or below 29 cents with high volumes exceeding mean of 16 million and 79 million of Apr-2. Titled ‘Key Drivers, Emerging Trends, and Development in Corporate Banking,’ the study discussed how new competitors in the financial technology sector are overtaking corporate banks. It posed two key trends, Artificial Intelligence and Blockchain, the combination of which could serve corporates speedy financial services, including optimized utilization of supply chain, know your customer, identity management, and trading. Authors Finextra Research and Oracle Financial Services wrote that deployment of AI would see the launch of “cash management solutions” and the attainment of “governance and regulatory needs.” Such an infrastructural overhaul would require corporates to manage a massive amount of computational data while maintaining its integrity. Blockchain will be able to address such a challenge. The authors added that it was likely for corporates to invest in a blockchain solution than seeking support from their banks. The statement followed a World Economic Forum research which predicted that blockchain platforms would store 10 percent of the world’s GDP in the next decade. The report added that central banks’ and monetary policies’ sluggishness was a roadblock before blockchain’s growth. But that was not deterring corporates from testing blockchain in their private sandbox environments. That said, a bank had more hurdles than a corporate chain when it came to utilizing the digital ledger technology. That bought one more time against the other. For instance, tech companies such as IBM and Alibaba had filed more blockchain patents than Bank of America and MasterCard. Nevertheless, the BoA held the most at 82. The Finextra-Oracle report admitted that the business case for corporate investment in the blockchain would take more time. It could be due to the technology’s inherent issues, mostly related to its scalability in a distributed environment. Also, there are concerns raised about the blockchain’s potential use case over an already available database management technology. “Banks are now working on various use cases leveraging the integrity of data that blockchain provides, thus creating a single ‘golden source’ that can be viewed by multiple parties. This is a key advantage,” reasoned Finextra. At the start of this month, James Lau, Hong Kong’s Secretary for Financial Services and Treasury, informed the Legislative Council that the purchase of mining equipment falls under the Trade Descriptions Ordinance. This move places restrictions on who can mine cryptocurrencies like bitcoin. But, does it also signal a change in attitude towards crypto by the Hong Kong authorities? Hong Kong is a center for fintech innovation and a significant market within the blockchain economy. As a Special Administrative Region, it benefits from different legislative rules than Mainland China – which shows in their liberal approach to cryptocurrency. At present, there are no statutory instruments to regulate cryptocurrencies directly. However, Hong Kong legislators are working towards changing this. As cryptocurrencies have grown in popularity, so has regulatory concern over investor protection. In November 2018, the Securities and Futures Commission (SFC) revealed proposals for a new regulatory framework, which focused on exchanges. But more specifically, outlining a route to the licensing of crypto exchanges. Under this scheme, crypto exchanges are required to deal only with institutional investors. Which the SFC sees as necessary for safeguarding investors. But as yet, there is no specific timetable for proceedings. Is Hong Kong Following China’s Lead? Recently, the world’s largest producer of crypto mining equipment, Bitmain lapsed its IPO application for the Hong Kong Stock Exchange. Some have attributed this to low Bitcoin prices, affecting the company’s financials. But then again, others see this move as symptomatic that Hong Kong is no longer the crypto haven it once was. Although regulation is a necessary component for investor protection and confidence, are the harsh exchange proposals and restrictions on purchasing mining equipment too much? Hong Kong prides itself on being the freest economy in the world. The Index of Economic Freedom examines factors related to taxation, government intervention, and openness to global trade and investment. It scored Hong Kong first, ahead of Singapore in second place. That being so, one must wonder why cryptocurrencies are not afforded the same leeway. As much as some cynics, such as traditional investor Mark Dow, like to paint it, institutions are heavily invested in the crypto space already. Sure, the Chicago Board Options Exchange (CBOE) recently divulged that it intends to put its Bitcoin (BTC) futures vehicle on the backburner, but investment statistics accentuate that big names are flooding into this space. Business Insider reports that “major financial institutions,” coupled with prominent venture capital groups and technology powerhouses, are continuing to catapult money at the cryptocurrency and blockchain space. Data suggests that in the past four months alone, startups in this embryonic space have secured $850 million in 13 large deals. Lesser-known yet respected crypto exchange Liquid, for instance, just closed its Series C funding round, which saw its private value rise to over $1 billion. Liquid saw cheques written from IDG Capital, a prominent Asia-centric venture fund, and Bitmain, the Bitcoin mining space’s most prominent yet controversial player. In the same vein, Bakkt, the cryptocurrency initiative/platform backed by NYSE’s owner, the Intercontinental Exchange (ICE), saw a casual $182.5 million fly its way, kicking off 2019 with a bang. This influx of funding comes in spite of “finance execs’” worries that blockchain as a technological advancement still has an array of drawbacks: lack of regulatory clarity, failure to interoperate, a lack of network continuity, intellectual property concerns, and an inherent inability to scale. If the level of investment keeps its pace for the rest of fiscal 2019, annual funding for blockchain and crypto asset startups will have seen its “second consecutive annual record,” as last year saw $2.4 billion raised in 117 different deals. Interestingly, this figure cited by Business Insider contradicts the $1.6 billion of 2018 funding mentioned by industry analytics unit Diar, but the point is clear nonetheless: big names in finance, tech, and investment are still interested in this industry, 80% collapse aside. Not only does the financing side of the cryptocurrency space have a heavy institutional atmosphere, but so does the Bitcoin markets themselves. In fact, on Tuesday, Matt Hougan, the head of research at Bitcoin exchange-traded fund (ETF) hopeful Bitwise, revealed that as his firm’s trade volume provider revealed that the volume of the CME’s BTC futures passed that of the largest legitimate spot exchange, Binance. While the CME’s futures are paper-based, meaning that there is no physical collateral in the form of BTC backing them, this does show that institutions do play a bigger role in cryptocurrency than some think. And this concerted effort to boost Bitcoin’s spot value might just be the catalyst that brings the genie out of its proverbial bottle, as institutional ramps are soon expected to launch en-masse. Although Bloomberg, citing those familiar with Bakkt’s operations, recently wrote that the U.S. Commodity Futures Trading Commission (CFTC) isn’t all too excited with its Bitcoin futures proposal, the platform is purportedly still chugging along. The sources explained that instead of a green light from the CFTC, Bakkt is looking for a stamp of approval from New York’s regulators, which have historically been stringent, albeit still cautiously amicable towards Bitcoin-related ventures. If the exchange secures this approval, Bakkt will soon launch its futures product, which many pundits expect to be a hit with institutional players waiting on the sidelines with millions, if not billions of dry powder. Crypto warlord John McAfee has been making waves from his yacht in the Bahamas recently. He claims to have spoken with the elusive Bitcoin creator Satoshi Nakamoto and has threatened to reveal his identity. Several in the industry have already commented on the negative impact this may have on Bitcoin and crypto prices. Bitcoin has been on a roll recently as April has seen the asset lift itself off the floor and surge 36 percent to top out over $5,600. Just yesterday BTC broke through resistance as the fabled ‘golden cross’ formation occurred signaling further bullish gains. He added that he has actually spoken with Nakamoto who was less than pleased about efforts to reveal his identity which has remained elusive for over a decade; “I’ve spoken with him, and he is not a happy camper about my attempt to out him,” adding that he is a technologist that has spent a lifetime pursuing hackers. “My entire life I’ve been tracking people who are the best in the world, and hiding their identity. Finding Satoshi was a piece of cake for me,” he added. Satoshi Nakamoto, along with a number of early pioneers, is believed to be one of the largest holders of Bitcoins. It has been estimated that he could hold as many as a million of them which would equate to almost 5 percent of the entire supply. At today’s prices they would be worth around $5.5 billion. Since this stash has not moved in a decade many had presumed he had passed away. If these Bitcoins enter the market it would put massive pressure on prices noted Bloomberg comparing the scenario to Mt Gox trustees dumping BTC on the market previously. Bitcoin could quite possibly dump back to new lows if a million more of them enter the market and the crypto market could freeze over once again. Bitcoin price started a downside correction after trading as high as $5,641 against the US Dollar. The price tested the $5,500 support area and recently bounced back above $5,580. There is a key bullish continuation pattern in place with resistance near $5,595 on the hourly chart of the BTC/USD pair (data feed from Kraken). The pair remains well supported on the downside and it could climb to a new 2019 high above $5,641. Yesterday, we saw a solid rise in bitcoin price above the $5,400 and $5,500 resistances against the US Dollar. The BTC/USD pair even broke the $5,600 level and settled above the 100 hourly simple moving average. 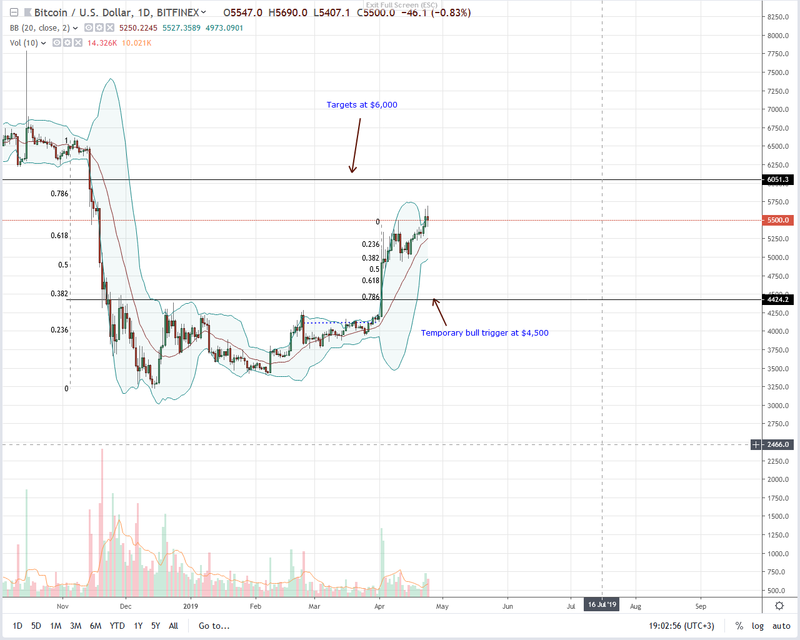 The price traded to a new 2019 high at $5,641 and later started a downside correction. It broke the $5,600 level and the 23.6% Fib retracement level of the last wave from the $5,361 low to $5,641 high. However, the price found a strong support near the $5,500 level. The 50% Fib retracement level of the last wave from the $5,361 low to $5,641 high also acted as a support. Moreover, yesterday’s bullish trend line with current support at $5,420 is intact on the hourly chart of the BTC/USD pair. Besides, there is a key bullish continuation pattern in place with resistance near $5,595 on the same chart. If there is an upside break above the triangle and $5,600, the price is likely retest the $5,640 level. The current price action is positive and it seems like the price could even surge above $5,650. The next stop for the bulls could be $5,700 or $5,720. On the downside, an initial support is near the $5,520 level. If there is a downside break below the triangle, the price could test the $5,460 support. It represents the 61.8% Fib retracement level of the last wave from the $5,361 low to $5,641 high. Looking at the chart, bitcoin price is clearly trading in a strong bullish trend above $5,460 and $5,500. There are high chances of a break above the $5,650 level. It will most likely open the gates for another run towards the $5,800 or $6,000 level in the coming sessions. Conversely, a close below $5,400 may negate the current bullish view. Hourly RSI (Relative Strength Index) – The RSI for BTC/USD jumped back above the 50 level and it is currently above 60. Major Support Levels – $5,520 followed by $5,460. Major Resistance Levels – $5,600, $5,640 and $5,700.